Set amid tropical gardens, The Green Garden Resort & Suites Hotel looks out over the Atlantic, with mountains in full view. The hotel, located in Tenerife, is walking distance from the Los Cristianos Beach and near the buzzing resort of Playa de Las Americas. The colonial-style one and two-bedroom apartments offer private pools that can be enjoyed by the whole family, besides a few with direct access to the beach, so you can make the most of your holidays in the sun. The rooms look out over an idyllic landscape, with three outdoor swimming pools and a golf course a little ahead making up the view. The Siam waterpark is a five-minute walk from the Green Garden Resort & Suites Hotel. You can also de-stress with a session in the Jacuzzi or at the spa. The buffet restaurant dishes out an international spread for you to choose from, while the snack bar will serve right by the poolside. 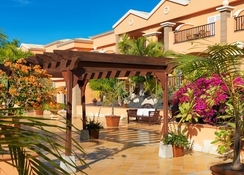 The Green Garden Resort & Suites in Tenerife is located between the resorts of Los Cristianos and Playa de Las Americas, with the beach just a 10-minute walk from the hotel. It’s about 2km from the waterpark Siam Park. The Tenerife South Airport is 14.6km away from the hotel, making it convenient for the guests to board their flights on time. Whether you are a garden view lover, golf course view lover, pool view lover or simply like to glare the sea, you can find a room to suite your taste here at the Green Garden Resort & Suites. 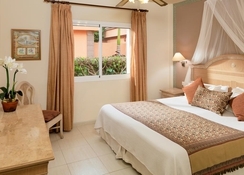 The room categories in the hotel include Garden View Suite, Superior Suite, Vista Golf Suite, Suite Two-Bedrooms, One-Bedroom Suite with Private Pool and Two-Bedroom Suite with Private Pool. Bright, spacious one and two-bedroom apartments come with a dining area and kitchenette, equipped with a fridge, microwave and coffee-maker. Green Garden Resort & Suites features an a la carte restaurant, where you can enjoy a full menu of delectable menu in a cozy atmosphere. For drinks, you can head to the pool side bar that serves refreshing drinks and snacks on an all-inclusive basis. If you want to explore more, then you can try out the restaurants and bars that are spread around the hotel. Additionally, the hotel also provides in-room food and drink service to make the guests comfortable. The Green Garden Resort & Suites Hotel, perfect for a family holiday, hosts two freshwater swimming pools, a children's pool, Jacuzzi and sun terraces. There’s a free shuttle to the beach, which is a 20-minute walk away. In the evenings, you can look forward to live shows and animation. Kids will love a trip to the Siam waterpark about a kilometre away. There’s also a mini-market, where you can pick some treats. Visit the gym to maintain your fitness, while the kids get busy on the playground. Book a session at the spa for an invigorating massage. Or tee off to the Golf Las Americas for a good session of golf practice. Please Note : Partial Renovation : The Hotel will be under partial renovation from 08/03/2019 to 07/07/2019. I cannot find any faults with this resort. The staff were helpful and very friendly. The first day we arrived in our room we noticed the air con and ceiling fan was squeaking, i reported it to reception and within 5 minutes a member of staff arrived to fix it. I cannot fault the place it was clean and the food was out of this world. We have already booked our next holiday there in october and we cant wait to return to this great resort. Absolutely wonderful hotel with tremendous s/c rooms (quality a/c). 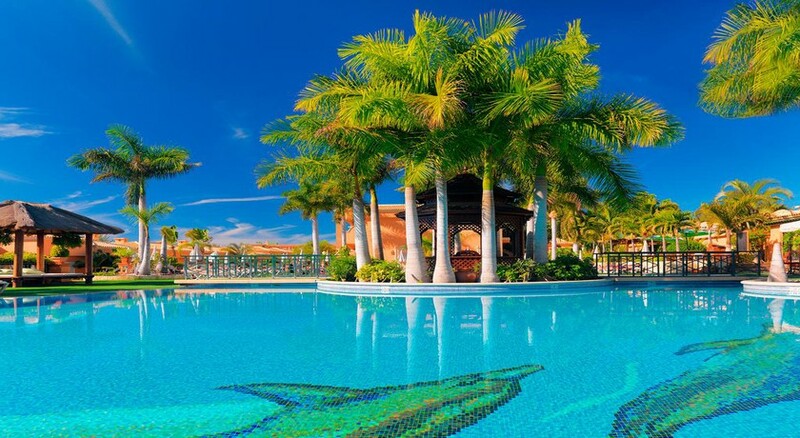 Pool is brilliant and you can buy all inclusive for a day to save you leaving the site. on site shop that's not that expensive compared to local shops. Cannot comment on shows as I didn't watch any. Would not hesitate to book here again and I'm sure my wife will actually insist we stay here next visit to Tenerife!